Bonn City has a problem. No, not the Beethoven Hall catastrophe. No, not the debt problem. No, not the swimming pool plan. I’m talking about the other one, the one that is seriously impacting health and quality of life. Air pollution levels have risen above permitted norms. Public transport quality appears to be dropping. Traffic levels are too high. The ongoing discussion involves diesel cars, electric transport, free public transport, cycle infrastructure, parking and even ski-resort style cable-car lifts. It’s a complex mix of projects and difficult to follow. Thanks to a recent statement from the City of Bonn, however, there’s a concise summary of actions available. This bullet-point list is important for every citizen of Bonn; to be aware of it in any discussion on the topic, to understand it before engaging in online clicktivism and as a platform for further discussion, ideas and accelerated progress. The statement, linked below, came from the Mayors office (Mayor Sridharan, CDU party) just 24 hours after a high court in Germany ruled that cities can consider banning diesel cars in order to reduce emissions. It also comes a week after a leaked document suggested that Bonn could become a test bed for free public transport. The headline statement is that our Mayor is opposed to a ban on diesel cars but alongside the statement, the mayor’s office has listed all the existing activities and projects that are underway. I’ve listed the 9 points below. For the record I’m not a fan of ‘free’ (or ticketless, as it’s better described) public transport but I am a fan of reducing the number of cars in the city and reducing air pollution. I am a fan of banning diesel cars under some conditions. More importantly though I believe that if there’s a plan, citizens should know about it and push for the best possible results. That’s my position. Now here’s the position of the city of Bonn on free public transport. I will not translate directly and may add references to the information in the original statement above. Before reading the list it’s important for the citizens of Bonn to know that the air quality plan (luftreinhalttungsplan) is controlled by the regional government (Bezirksregierung Koeln) which makes its decisions through a separate council. They may give Bonn the right to input into the plan and may delegate some options to the city but what they decide is what Bonn will have to implement. It is not a discussion point for our city council. The city of Bonn has listed a 9-point plan that is Independent of any regional decisions on diesel bans but dependant on lasting and sustainable funding from the state. Some information is given below about state funding programs. SWB have a list of three projects listed on their website but I don’t see any dates and suspect this is not regularly updated. An interesting letter was sent from SWB to the council in answer to questions about the effects of diesel engines. Public document 1712627. In the response by SWB there are clear indications as to the project status. For example, SWB states that the availability of the electric buses is not as good as diesel. I was unable to find a public project plan for this item but I note that Bonn has recently requested a supplier for 4 hybrid cars. The bike rental system will be introduced by SWB in 2018. 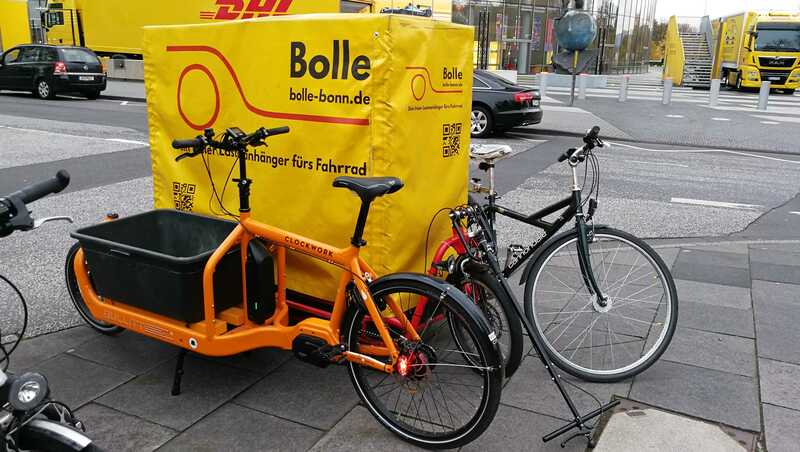 A request for proposals was started in February and includes a requirement for a minimum of 900 bikes at 100 virtual or fixed locations in Bonn. Prices for use of the system will be integrated in to the public transport charging system and will include limited free use by season ticket holders. Additional reference: SWB bike rental system project requirements. I note that I haven’t yet seen a tender for the bike rental system in the official list of tenders for the NRW region. The network of cycle routes will be expanded. Focus is on main routes such as the Bonn – Alfter – Bornheim route and routes on the right and left of the Rhein river. The project will also look to see what work can be done under the Emision-free City Center state funding program or other funding programs. Note: It is assumed that the Bonn project Fahrradhauptstadt 2020 is part of this program. The network of bus, train and bike offerings is environmentally stronger when a user can move with flexibility between them, and ones own personal transport. This is made possible through the use of ‘mobility stations’ where as many transport options as possible are attractively connected. The City of Bonn, in cooperation with the SWB, is currently working on initial plans for these mobility stations in Bonn, which could be funded from the “Emission-free City Center” program. The Rhein-Sieg-Kreis and the City of Bonn is currently working on a corporate mobility plan. The aim is to work with employers in the region to learn about existing approaches and to develop them further in order to reduce the number of car journeys, especially at peak times, with offers such as job tickets, service bicycles, etc. Digital networking is an opportunity that could improve transport . This applies, for example, to buses and trains, which are given priority at junctions. 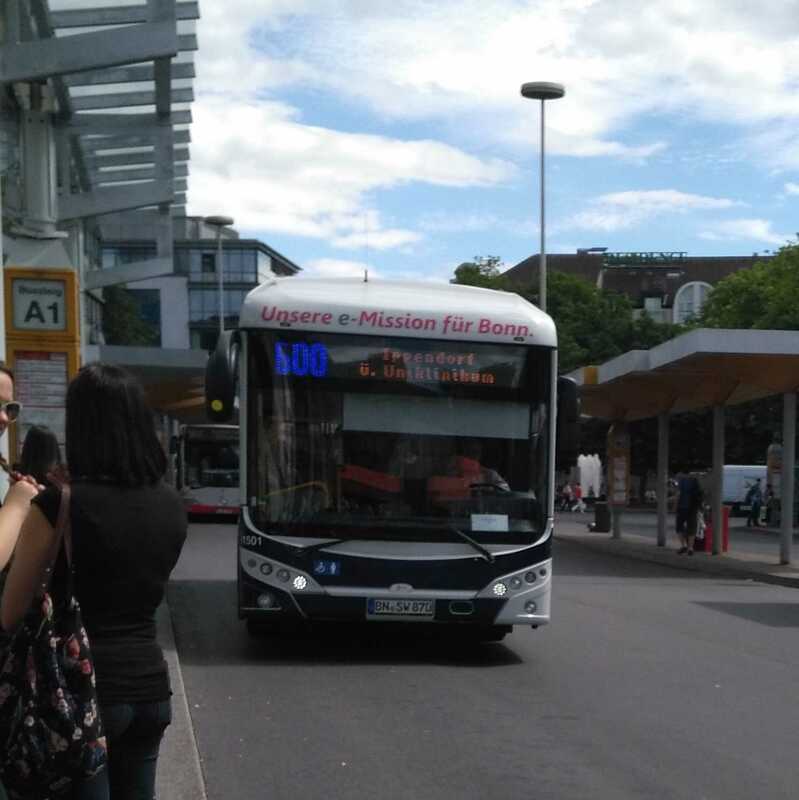 The city of Bonn and the SWB are working on the plans for networking the public transport network as part of a so-called “master plan”, which is funded to 100 percent by the federal government. In addition to the statements made by the mayor’s office there’s also a program being implemented at the Uniklinik Bonn Venusberg. Mobil am UKB includes improvement of buses, an e-bike purchase program and discussions with road planners. A large part of the concept is the cable car (Seilbahn) implementation. The Mobil am UKB feasibility study forms the basis of the UKB project. A local activists group, Verkehrskonzept-jetzt, is also reporting on the current status. The German Partnership for Sustainable Mobility has produced an extensive guide to touring Bonn in an eco-friendly was and includes information about public transport, bike rental. It also includes relevant historical information. Discover Bonn by Sustainable Transport is available as a downloadable PDF file. Bonn im Wandel is another group of activists in Bonn worth tracking. Running a program of transport and air-quality improvements for a city is complex, and expensive but it’s also urgent and it requires input from the people that live in the City. Stearing a project is easier than correcting a bad one. Please lead, and refrain from clicktivism! Is something missing? Your feedback is more than welcome. (In German, also welcome!) I will continue to try to track this subject and may update on my Twitter account via the #Bonn hashtag. « Rhein Cruise and Ship Tracking. Hi Mum!